I’m no expert, but I have a lot of fun painting minis. With some regret, I increasingly turn to plastic pre-painted minis. It does save a lot of time, which is in short supply. 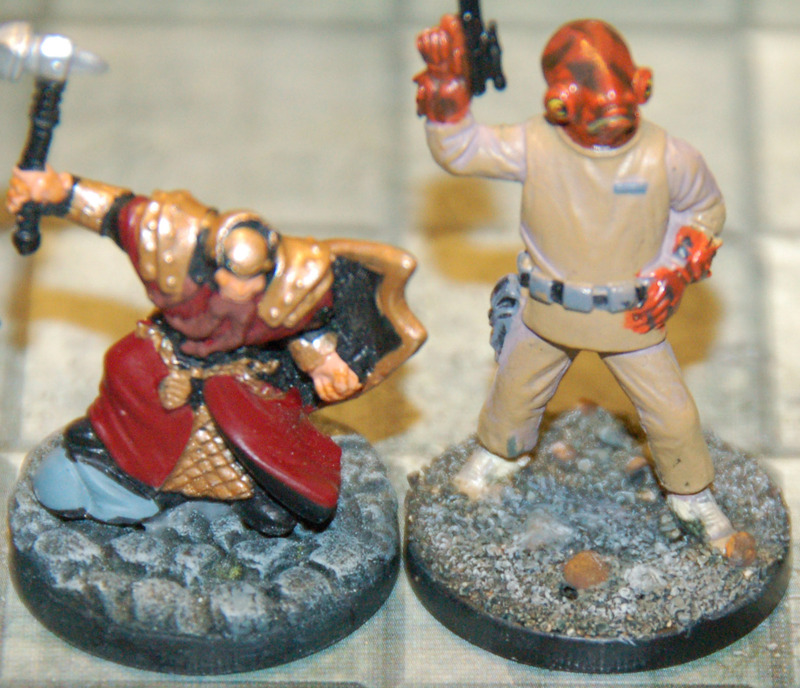 But, it is nice to spend a little of Zen-like time enhancing D&D or other painted minis. The easiest way to do this is to add something to the bases. There are two ways to do this. In this method, you separate the mini from the base, set up the base (see below), then add pins into the legs of the mini, then re-join the mini. I did this a lot at first, using modeling “paper-based” clay to make all sorts of neat features, then pin the mini in with super glue. But, I found they often came apart. Thus, I do this sparingly. I prefer knowing the minis will not come apart than working on this level of detail. One nice thing about this method is that the shoes of the mini will really be on top of the terrain/base, which is more realistic, and you can do things with poses, different angles (sloped terrain, mini is charging, etc. ), and so on. The simplest method is just to add something to the base and keep it intact. This generally is confined to adding “flock” to the base, though you could first separate the mini as above. You generally can’t do anything too drastic because you would cover up the mini’s legs and it would look strange. Flock comes in many forms. Static grass can be purchased, and is fake green grass that you can add. Static electricity keeps it standing up until the glue sets. You can also use real grass with some care around other materials. Grass needs to be small to look right. Sand is super-easy. Find fairly fine sand, such as from a beach. Ideally it has several different sizes, not just a single grain size. You can also take something like playground sand and mix in really small rocks. You can also start by gluing a few small rocks, then add more glue and pour the sand on top. Generally, I just pick a few small rocks, turn them around on the base, figuring out where I want them. I use normal craft glue and stick them in place. Generally 2-3 is enough. Then I wait a few minutes. Then I add glue over the rest of the base and then sprinkle sand over the glue-laden base. I press gently with my fingers, then before anything dries I use something small (the point of an Exacto knife works well) to pull away any grains that are on clothing, too close to the feet, etc. Once the sand has dried, you can add a bit of dark-colored wash. I use a darker color than what I intend the base to be. After it dries, use dry brushing with very little paint on the brush and with increasingly lighter tones to make the surface look natural. This painting effect often makes the mini more realistic than the natural sand alone. Gray can actually make a pretty good dungeon-like floor, looking like broken flagstone/rock. Several different bases, using different materials and paint colors. Taking the ideas of a person posting on the WotC forums, I tried his technique on some minis for an adventure I was running. Basically, you take one part glue, one part water and then mix baking soda until it is a really thick consistency. You want it to really glop on there so you can form peaks. Once you finish, you can sprinkle some dry baking soda to make the surface look a bit more like snowfall. You can start the process with small rocks, branches, and so on to add more to the base. It can also be a good idea to paint the base so you have an underlying color other than black. Finally, you can paint with silver or light blue to simulate melting water. If desired, you can add snow to equipment and/or use a light blue-white to make a mini or its gear look like snow fell upon it. You can see the snow troll to the left below, as well as how I added snow to both troll’s gear. 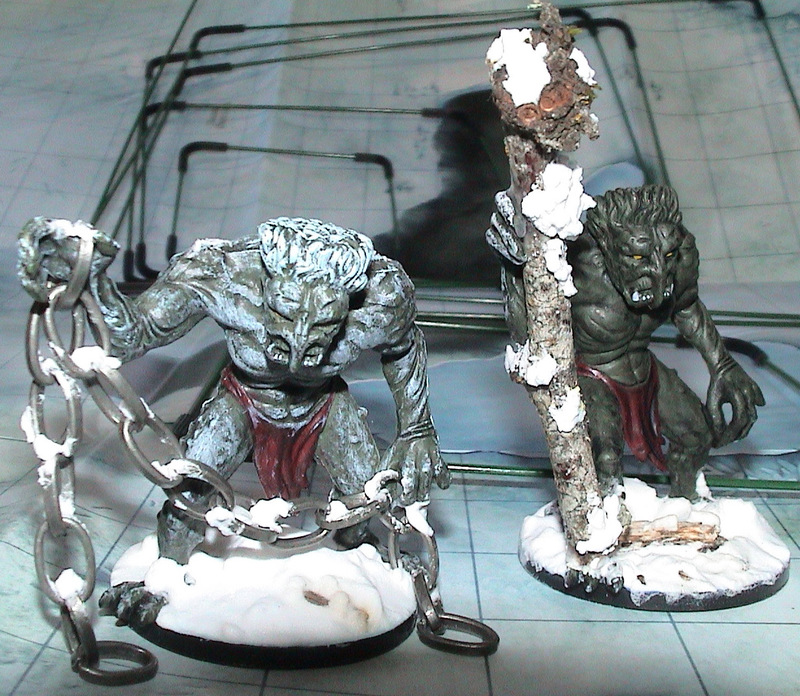 Anchor Troll and Timber Slinger, with snow bases. This entry was posted on October 1, 2015 by Alphastream and tagged Miniatures, Painting, Props, Terrain.